Handle slabs developed cracks in three places ( visible on picture) where they are pinned to the frame. To cover it for esthetic reasons I have commissioned Lori Ristinen to add a scrimshaw . Chosen motif was her choice and I think , it complements this knife very well. Wave ZDP damascus -189 steel core blade is 2-5/8" long. Closed knife: 3-5/8"
Gary House heath blued mosaic damascus handle. 18K rose gold inlay and bail is carved by Amayak Stephanyan. Diamonds in thumb stud and locking button. Anodized titanium beads, stainless fittings. Damascus blade is 3" long. Closed knife:4-1/8"
Stainless frame engraved by R. Cover, file worked all around, stainless back spring and bail. Mother of pearl scales with abalone inlay. Ladder pattern damascus blade is4" long. 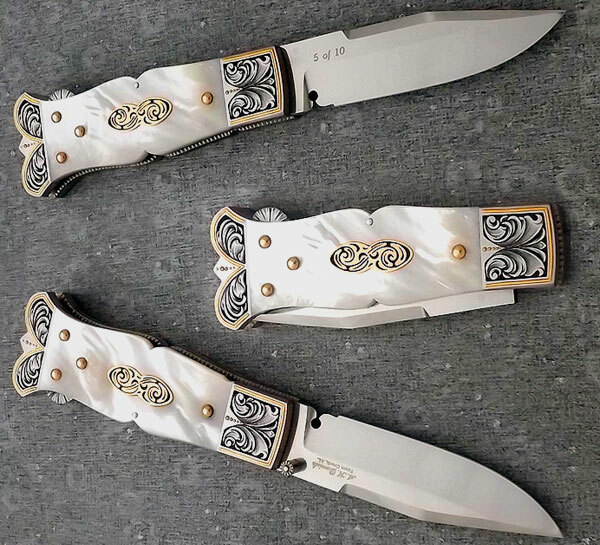 Closed knife is 5-1/4"
Carved elk antler handle with gold fittings. Rock on the hard wood stand. ATS-34 stainless blade is 2-5/8" long. Closed knife: 4-5/8". 416 stainless frame engraved with gold inlays by Julie Warenski. Abalone Schell inlays in the frame. 440C stainless blade is 4-1/4" long. 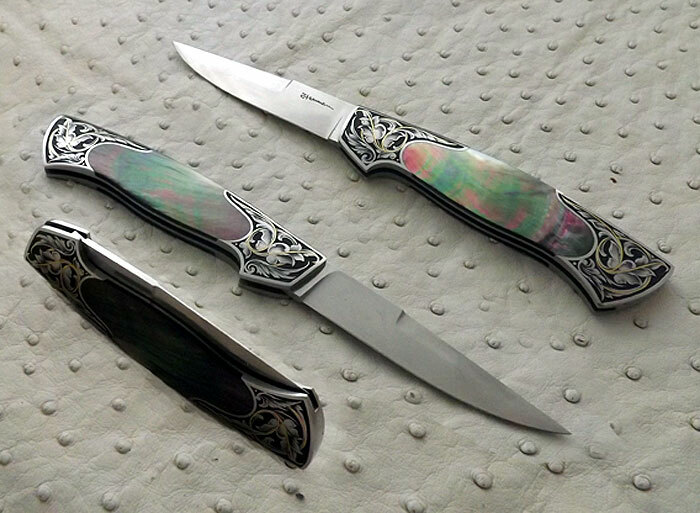 Closed knife: 5-1/2"
416 stainless frame has gold and cloisonné inlays with gold wire on French Gray finish. Elizabeth- like her father and teacher- sculptures her knives with hand files only. It is a very time consuming process but effect is smooth to the touch and sharp looking at the same time. The closed knife's picture is in actual size. Elizabeth's knives often remind knives made by her father- Wolfgang and sometime is difficult to tell them apart. This is a great achievement on her part as he is truly one of the best. It would be curious to see where her already great skills will take her. ATS-34 blade is 3-1/8". Full length: 3-3/4"
440C frame. 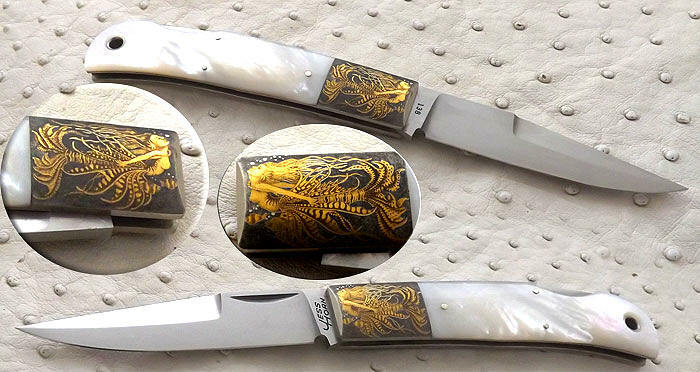 Frame, blade and spine are engraved with gold inlays by Lageose. Pink pearl inlays in the handle. Carved damascus blade is 3" long. Closed knife:4"
Carved damascus bolsters and release bar , file worked titanium liners and stainless steel spine with mammoth ivory inlay. Mammoth ivory scales. Stainless damascus (Mike Norris "Ribbon Lace") blade is 3" long. Closed knife 4"
Damascus frame, black lip scales. Diamond thumb and button. Titanium and stainless fittings. Sterling silver bail and beads. Box, Leather sheath with clip and certificate of authenticity. Stainless steel blade is 3-1/4" long. 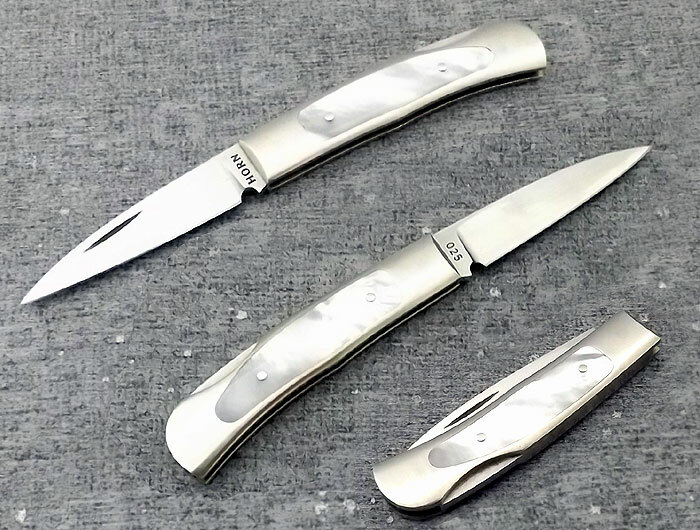 Closed knife: 4"
Nickel silver bolsters integral with liners, stainless back locking spring. Mother of pearl scales. Gold inlays engraved by Julie Warenski are reproduction of art piece by Chris Achilleos. ATS-34 Blade is 3" long. Closed knife: 4-1/8". Stainless frame engraved with gold inlays by maker. Black lip mother of pearl scales. Mike Norris SS Damascus Blade is 3 5/5" long. Closed: 4-3/8". 416 SS frame engraved by Jon Robin. Black lip M.O.P. inlays. Blade: bg42 steel, length: 3-5/8"
Bolsters and internal parts are made of stainless steel and file worked liners of nickel silver. 24K gold domed pins and escutcheons are set on Mother of Pearl scales. 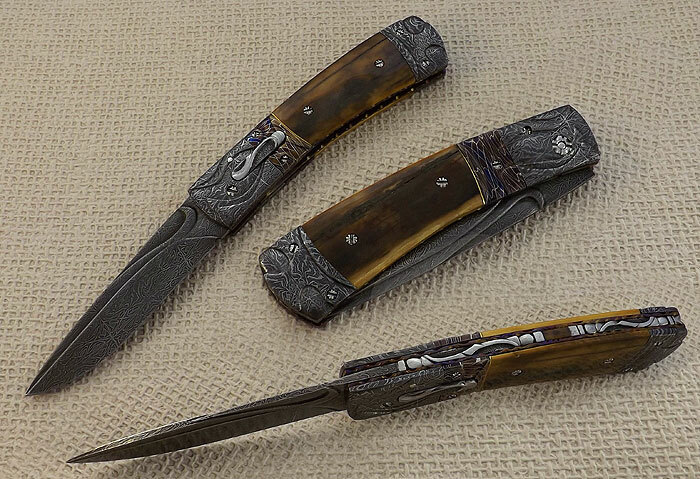 This knife is the folding reproduction of Broomhead & Thomas antique bowie knife. ATS-34 steel blade is 2" long. Closed knife is 2-1/2" long. Nickel silver frame, 303 stainless pivot pin. Mother of Pearl inlays.